We only had one day in Portland (literally about 30 hours total), so despite the depressing cold rain, we ventured out into the streets for a familiar LA food trend that has truly taken off in Portland — Food Trucks. While LA has had plenty of organized food truck gatherings and events, we hadn’t seen anything quite like this before. The trucks would rent out the edge spaces of ordinary parking lots, face their storefront to the sidewalk, and open for business more or less every day. They are always there so you don’t need any apps or websites to track them down. Awesome, right? Determined to eat like the locals do, we managed to track down three main clusters of food trucks in downtown Portland. 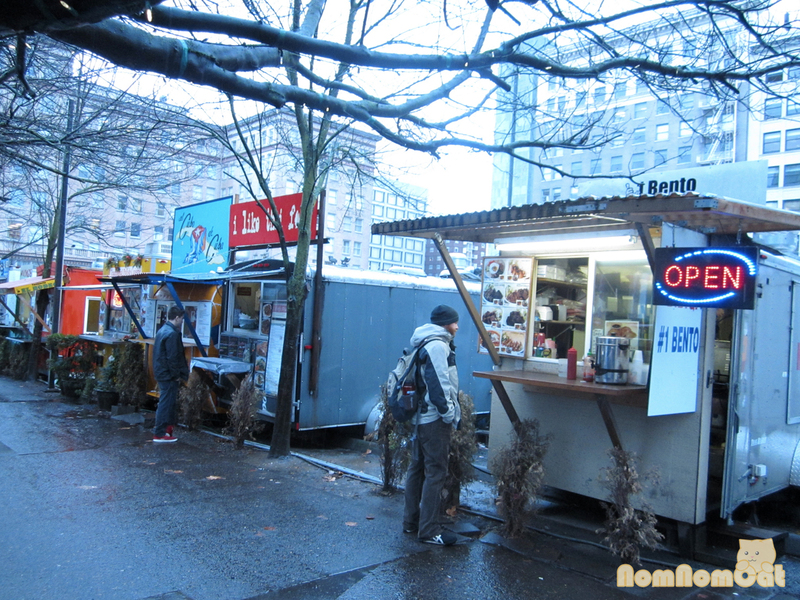 One of many food truck clusters in downtown Portland! – Spoons on 5th: it’s raining cats and dogs, and we were trying to be adventurous in our food selections, but who could possibly turn down a hot bowl of soup? We decided on the chicken barley soup, which comes in a cute wax-lined paper cup with a hunk of rustic bread. The guy behind the counter was friendly and clued us in on where to find shelter (hint: the bank/mall across the street has seating areas, couches, and coffee tables for your on-the-go dining pleasure). The soup itself was hearty with a bit of an unexpected kick from the black pepper. Martin polished it off happily. 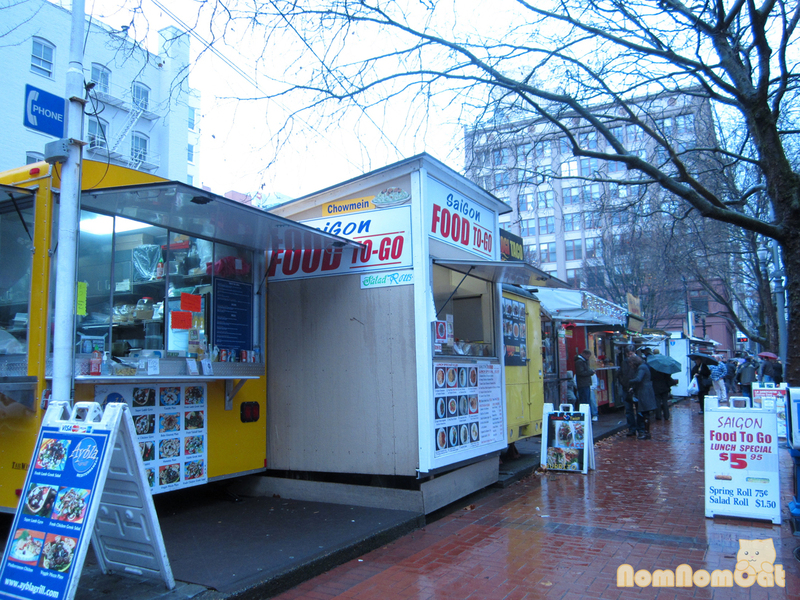 – Saigon Food to Go: there is a surprising amount of Vietnamese food vendors in Portland! I was tempted to try their pho but opted for the safer and easier-to-eat goi cuon (“salad roll”) instead at $1.50/each. A bit steep but the rolls were fresh – definitely made that morning because the rice paper was still deliciously soft and supple (every spring roll enthusiast knows how hard and tough the banh trang gets when refrigerated for ANY period of time). The sauce was not particularly special but good nonetheless. – Samurai Japanese Cart: I loved the Engrish on their whiteboard announcing that “New Year’s Coming!” – super cute. Their menu boasts a variety of bento perfect for a quick lunch for nearby office workers but one in particular stood out to us – the agedashi tofu bento. This took a bit of time to prepare, but it was AMAZING. 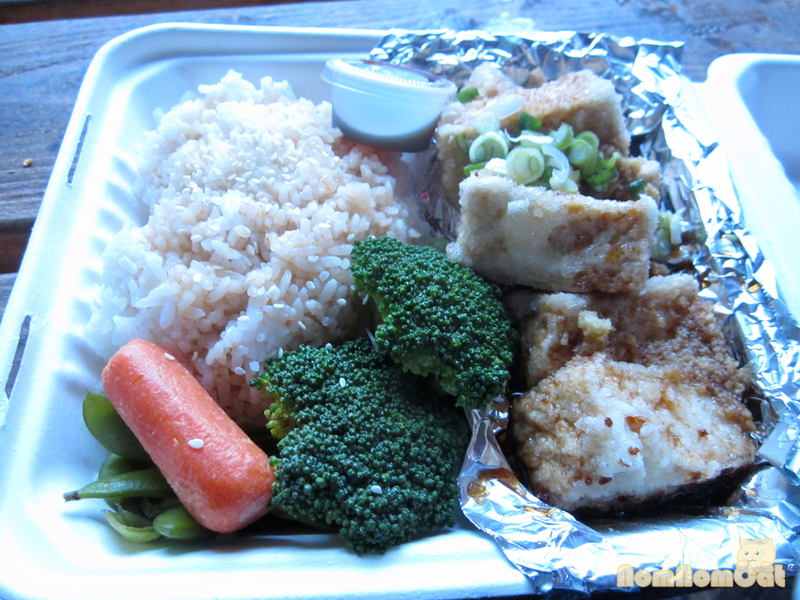 The blocks of tofu were fried fresh to order and they were breaded with mochiko which disintegrates in the sauce and becomes a thick, gooey coating. LEGIT. This agedashi tofu comes with a sweet soy sauce rather than the dashi broth I’m used to, but it tasted great. The rice is piled high and the order comes with some steamed veggies (also made to order). They even gave us hot genmaicha while we waited in the rain, and they’ve arranged a place between carts for customers to sit. 5 stars in my book. I’d come here every day if I lived or worked nearby! I also found out after looking them up on Yelp that the famous Japanese animator and film director Hayao Miyazaki likes this place when he visited Portland. If that isn’t a vouch for authenticity, I don’t know what is! What initially brought us to 2nd & Washington was Built to Grill (which is rated ridiculously highly on Yelp), but they were closed for the day. :( Unfazed, we explored our options and decided to pick up dinner for our impending long (LONG) bus ride to San Francisco. 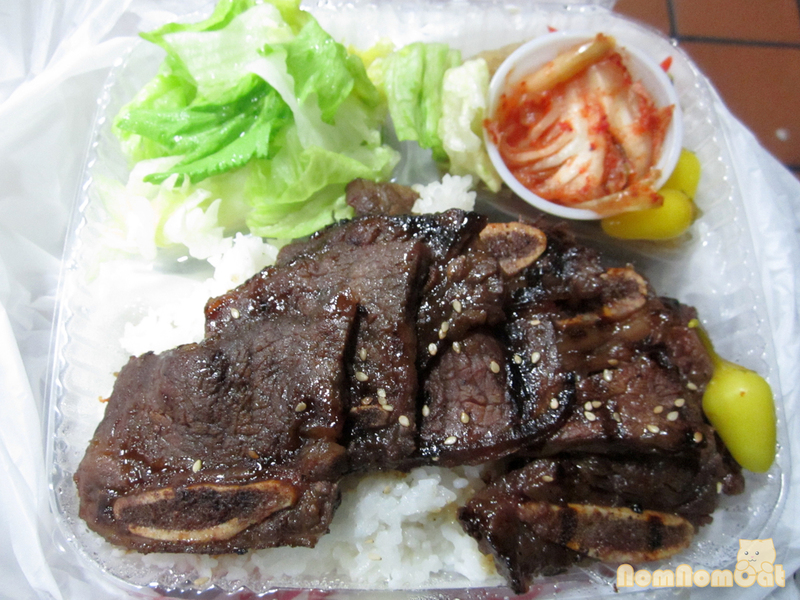 – Taste of Korea: Reminiscent of the Korean bbq places we left behind in LA (particularly Gushi in Westwood, probably because of its teeny tiny hole-in-the-wall feel), this food truck offers rice plates with meats ranging from bulgogi to kalbi to spicy chicken. Martin decided on the fried tofu platter and I had the kalbi platter. I thought the $10 price tag was a bit steep at first, but then we received the to-go bag and WOW was it heavy! Each plate had a serving of salad (they remembered to leave the dressing on the side for us), a plastic container of kimchi, and a serving of my favorite banchan – japchae (Korean stirfried glass noodles – it is under the little cup of kimchi in the photo below). In the main section, you can’t miss the very generous amount rice. My order came with about 3 or 4 strips of the delicious, slightly sweet barbecue short ribs — almost double the portion you get for a plate at most places — and Martin’s had a few large triangles of breaded and deepfried tofu. Yum! There really is something for everyone when you eat at these food truck clusters. Aside from American fare like soups, sandwiches, and burgers, the ethnic cuisines ranged from Mexican to British to Greek to Thai and much more! We even spotted a teeny tiny booth (literally about the size of a phone booth) where one man set up shop to sell pho along the sidewalk. If only our stomachs were able to handle sampling every food truck/stand we saw! See their Yelp reviews here. This summer, an annual gathering to support sustainable and local products and produce, Eat Real Fest, hailing from Oakland, took over the parking lot at Helms Bakery and transformed it into a fun food festival to rival Carmageddon. The furniture stores became venues for discussion panels and forums, and the lines of the parking lot became rows of food trucks, displays, even a little resting area for fluffy goslings. 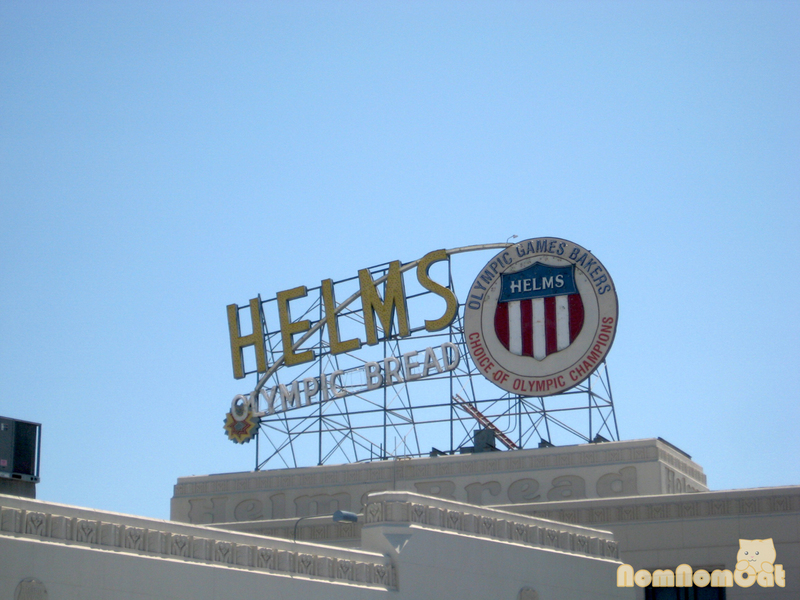 We woke up on that Saturday and took the 33 over to Helms, a convenient (and free!) way to get to the food fest. I was excited to try the many food trucks that were slated to be setting up shop, and the variety of DIY panels and cooking demos sounded fantastic! We were planning to make a whole day of it so we could also catch the Lit Fest discussion, very appropriate for getting our launch ideas! 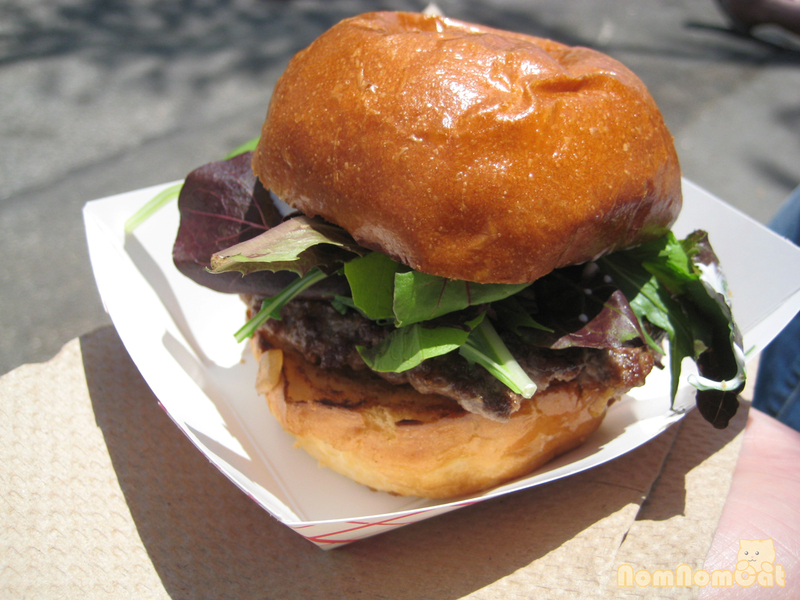 For lunch, we browsed the maze of food trucks and settled on sliders at Me So Hungry. We shared the Cali sliders at the recommendation of the guy who took our order. It was reminiscent of a mini Father’s Office burger, with applewood bacon, caramelized onions, arugula, and gorgonzola. It was good, but I was still pretty hungry afterward. Off we went to the Whole Foods truck (my first thought being “What?? Whole Foods has a truck? 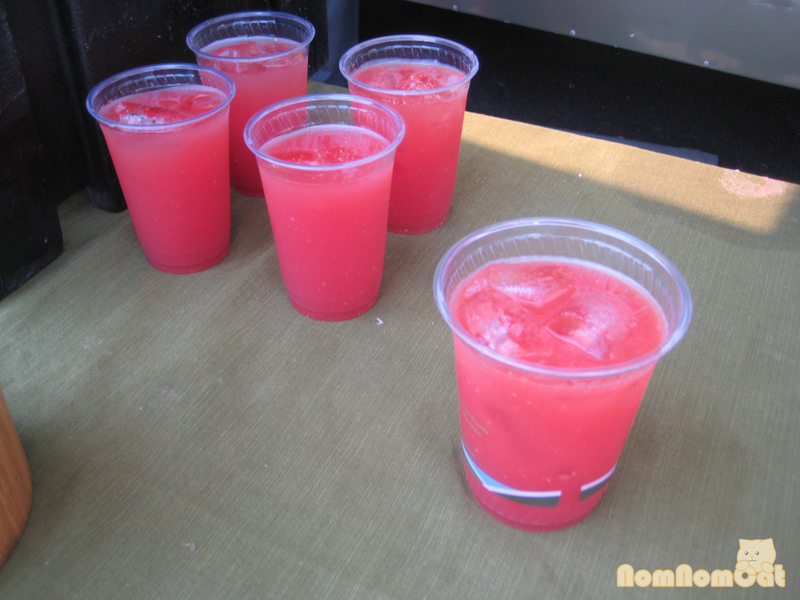 !”) to buy a refreshing glass of watermelon juice. It was literally a liquified watermelon with a beautiful brilliant red color and delicious crisp flavor. It was a pretty warm day, so we wandered into the indoors expo area, browsing the wares of many local jam makers, bakeries, and even Jamaican marinade brands. We saw these adorable grow-your-own-mushroom kits from Back to the Roots and I had to buy a pair (one for us and one for my mom. Ours have not been sprouting, but my mom picture-texts me with her progress. Too cute!). BTTR Mushroom Kits – also available at Whole Foods! We watched dozens of people scrambling for a spot to make their own sauerkraut (not our cup of tea) and eventually found a pasta-making demo from Chef May Parich of The New School of Cooking. This definitely caught my eye as we’ve been experimenting with homemade pastas ever since Martin bought me a Marcato for Valentine’s Day and made me dinner with it. :) She had a Kitchenaide with the pasta making attachment, but she still mixed the dough by hand using the “well” method. 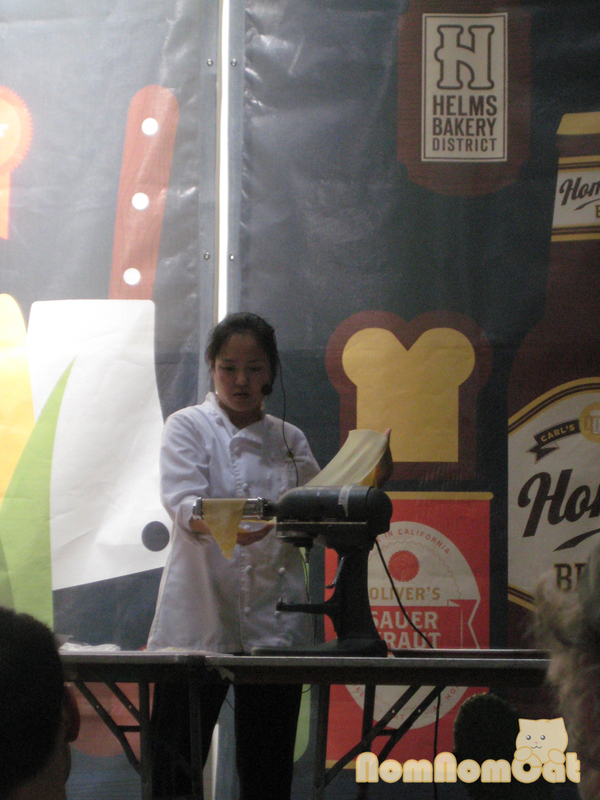 We learned a few neat tricks from her, the most important being the use of semolina. It truly makes a difference using a combination of semolina and all purpose flour, rather than AP alone. The chewy texture, the beautiful yellow color, all thanks to semolina! The other helpful hint was to roll out sheets of the pasta and let them sit in a baking sheet, with layers of saran wrap in between to keep them from sticking, so that you can cut the sheets all at once. We applied some of her techniques to our basic pasta, but we’re looking forward to trying Chef May’s ideas for spinach pasta, agnolotti, and much more! It was very interesting to learn about the perception, from both a reader’s and a writer’s standpoint, of these different types of food writing. Which is taken more “seriously” and which is more “easy to relate to”. What makes good food writing. How important is it to have good photos. 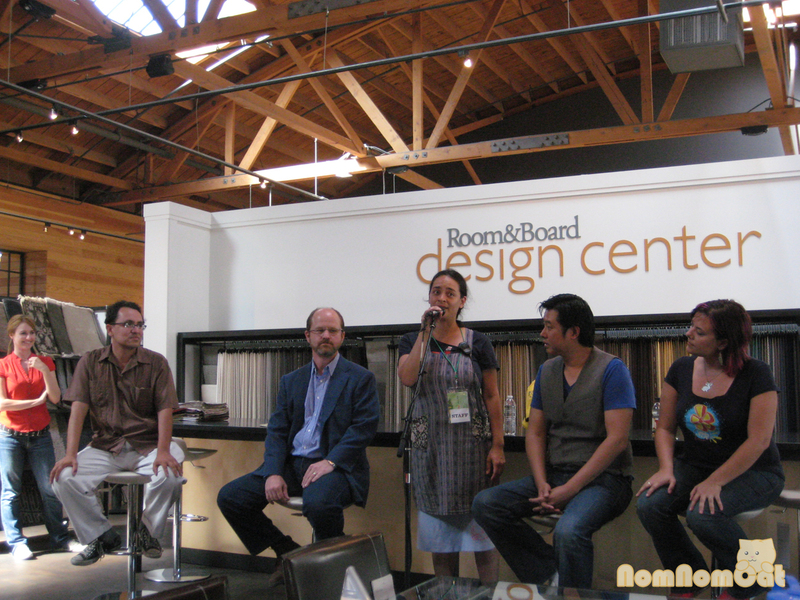 What was most helpful was being able to speak one-on-one with Eddie Lin after the panel to get ideas for our blog launch. He was very gracious but honest with his advice, and we definitely appreciated that. Our stomachs were grumbling for dinner by then, so off we went to the “alley” of food trucks. I had been wanting to try Big Mista since we first saw the man pulling out a drawer full of chicken wings and lovingly turn and baste them. And so we stood in line. It was almost 40 minutes before we reached the front of the chicken wing line, during which Martin had slid over to the other line to get us some pulled pork sliders. 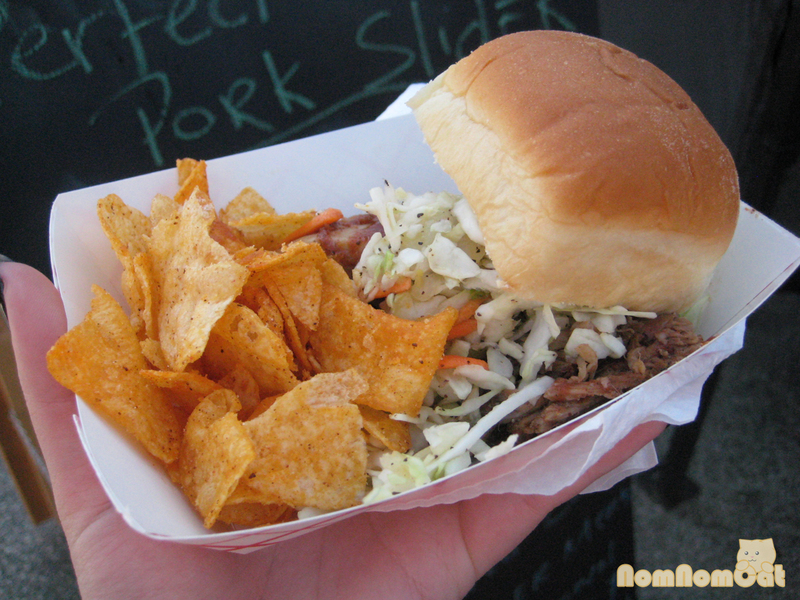 These were delicious; the meat was barbecue-y and flavorful and served on a sweet Hawaiian roll with crispy, cider vinegary slaw. Soon enough, the fresh-from-the-grill chicken wings were ready. And man, were they worth the wait! Where does one even find such HUGE chicken wings? They were the size of most chickens’ thighs! 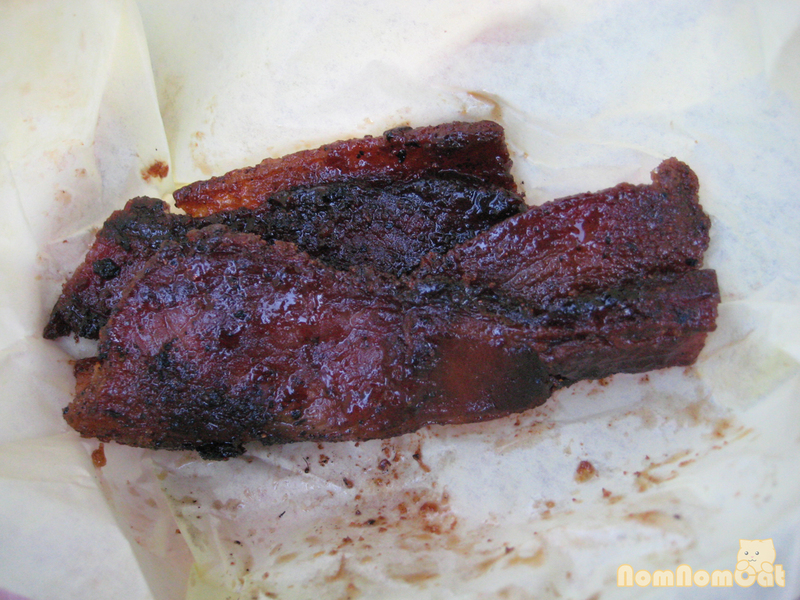 The barbecue glaze was sweet and sticky with a little kick to it, and the skin had crisped up nicely. 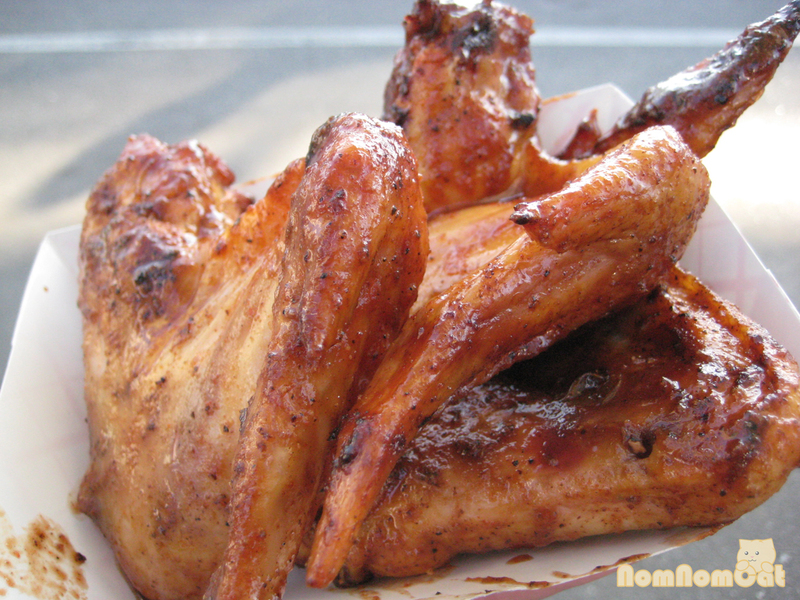 The meat was so juicy, and the wings overall were just fingerlickin’ good. 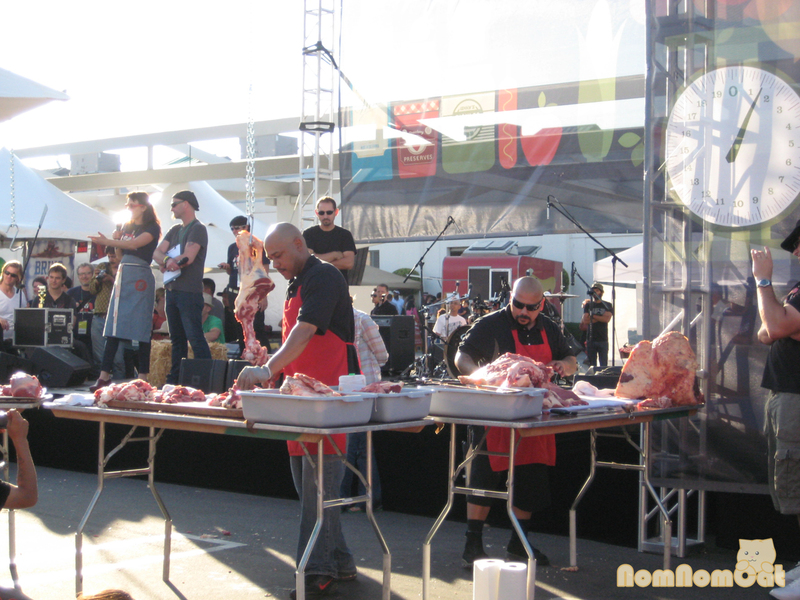 We devoured them in much less time than it had taken to get them, but no matter — immediately in front of us was the Flying Knives butchery contest. 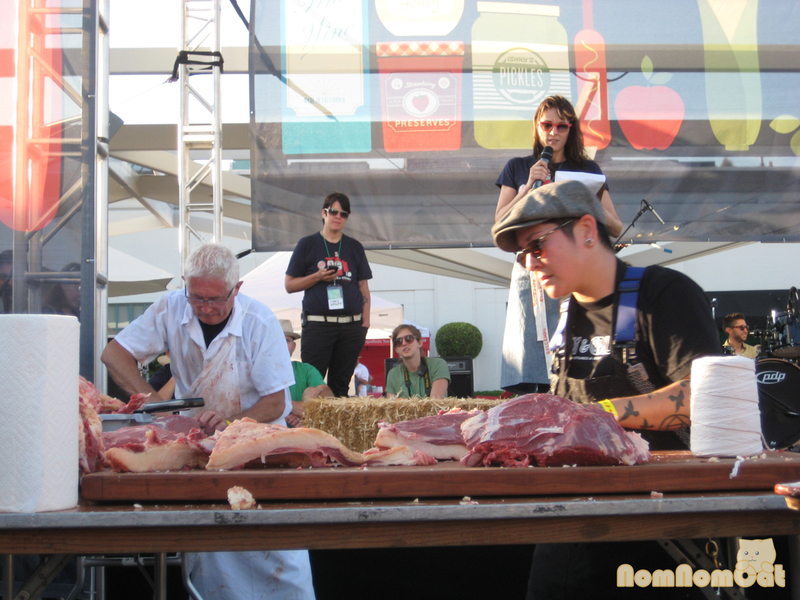 Two teams, each with a 1/4 steer to break down into quality cuts of beef. It was definitely a sight to see! We had a mad craving for steak after watching the frenzied sawing and slicing. We were tempted to get a shave ice before we left, but the sun was setting and it was getting chilly fairly quickly. Off we wandered toward the bus stop, looking behind us at the fun and informative festival that had popped up seemingly out of nowhere, as if it were all a dream. Eat Real Fest LA was July 16-17, 2011 at the Helms Bakery District. 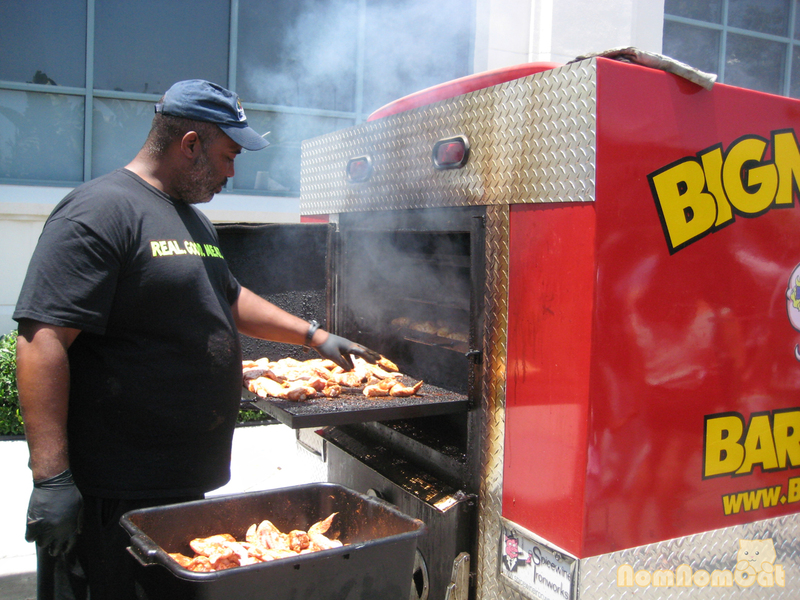 Eat Real Fest Oakland was September 23-25. 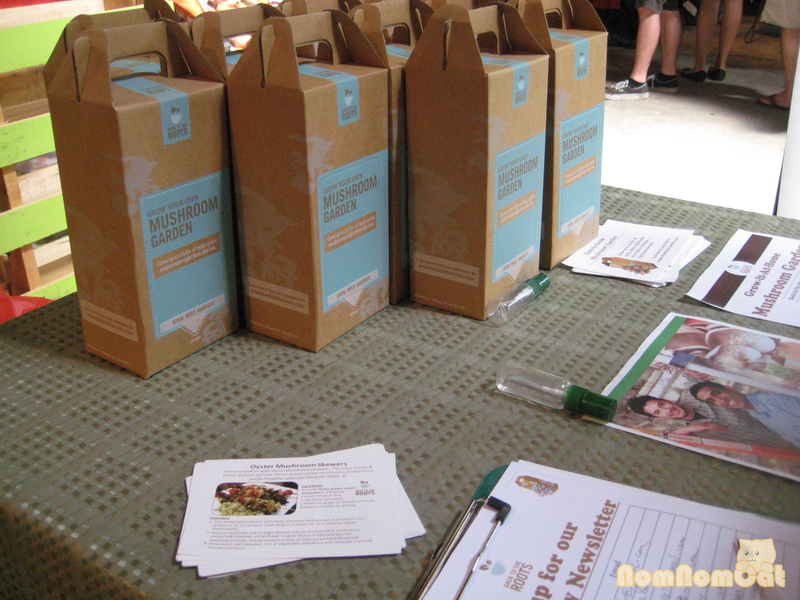 Check back for Eat Real 2012!